INVESTMENTS IN THE GROWING PET FOOD AND TREATS MARKET HAVE HELPED MANY PRIVATE EQUITY INVESTORS REALIZE SIZEABLE RETURNS FOR LPS. However, recent Food & Drug Administration (FDA) rulings require food safety controls similar to that of human food. Investment professionals must keep Food Safety, Regulation, and Compliance top of mind during due diligence and post transaction to preserve capital and mitigate risk. Over the last 10 years, we have seen Private Equity investment activity in the Pet Food and Treats sector increase substantially, particularly in the middle market. According to industry specialists, consumable pet products are commanding double-digit EBITDA multiples and 20 to 30 percent more than hard goods such as pet toys and bedding. However, as Private Equity investors have increased their activity, the risk profile of many of these investments may also increase, as investments in the pet food and treats sector comes with unique compliance and regulatory requirements not encountered in traditional manufacturing and distribution environments, particularly those associated with Food Safety. When investing in pet food, similar to that of human food, conducting Food Safety Due Diligence is a critical work stream. In the fall of 2015, the FDA published two Final Rules as part of the implementation of the Food Safety Modernization Act (FSMA); the first outlines the enhanced controls for human food, and the second establishes food safety controls for animal food. As such, investors should be aware of the regulatory environment when considering investments in the sector. In addition to conducting a Quality of Operations™ Due Diligence type assessment, food safety experts recommend conducting an independent review of the Target’s Food Safety and Compliance programs to ensure adherence to internal programs, assess management’s commitment to food safety and compliance, as well as verifying the implementation of industry best practices. Determining early on whether or not a target company is compliant with FDA regulations is critical to mitigating downside risk. While no facility is ever deemed “perfect,” it is important that investors consider gaps that exist in the target companies’ food safety programs. Also, it is critical to understand the potential liability and probability of a FDA shutdown or product recall – either of which occurrences could dramatically impact an investment. Mapping out a post-close risk mitigation and improvement plan that can be shared with the management team will ensure timely closure of critical corrective actions and ensure that management understands the Investors’ commitment to Food Safety and Compliance. PE investors should also monitor adherence of Food Safety and Compliance Programs post-close. Similar to the human food industry, an outbreak in the pet food industry can damage a brand extremely fast. In order to protect both pets and their human caretakers, management of Food Safety Programs should be regularly scrutinized, especially with respect to FSMA regulation. Investors should regularly request updates on program development and adherence, as well as request third parties to verify compliance and conduct on-site gap assessments. Investors must empower management teams to invest time, money, and resources into Food Safety infrastructure, which may require capital expenditures. Food Safety is a constantly evolving field that needs to be regularly probed to ensure effectiveness. Staying ahead of the curve will guarantee that risk has been mitigated and that the organization is adequately positioned to prevent recalls, minimize outbreaks and avoid other costly regulatory and compliance issues. 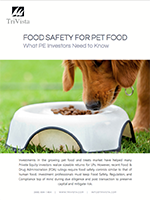 The final consideration for private equity investors in the pet food and treats sector is the impact Food Safety can have on the exit process. As we look towards the future, FSMA and Regulatory Compliance will continue to gain focus and attention from prospective buyers. Investing in the right resources during an investment hold period should net tangible results for investors. While it would be difficult to estimate the net positive impact of a robust food safety program on enterprise value, strategic acquirers and professional investors alike should find comfort in knowing their concerns have been addressed and that a program is in place to tackle every element of Food Safety. This alone should enable a faster deal process, higher likelihood of close, and potentially higher exit multiples.